As soon as the holidays are over, I’m going to work on whipping my kitchen into shape. I have plenty of storage space, it just needs to organized better. I know I can squeeze even more storage space out of it if I just put my thinking cap on. I decided to look for ways to organize the kitchen on the Houzz website, and I found quite a few ideas! A beautiful blue cupboard isn’t just pretty, it’s highly functional too! I have a built-in cupboard in my kitchen, but it isn’t organized as neatly as this one. 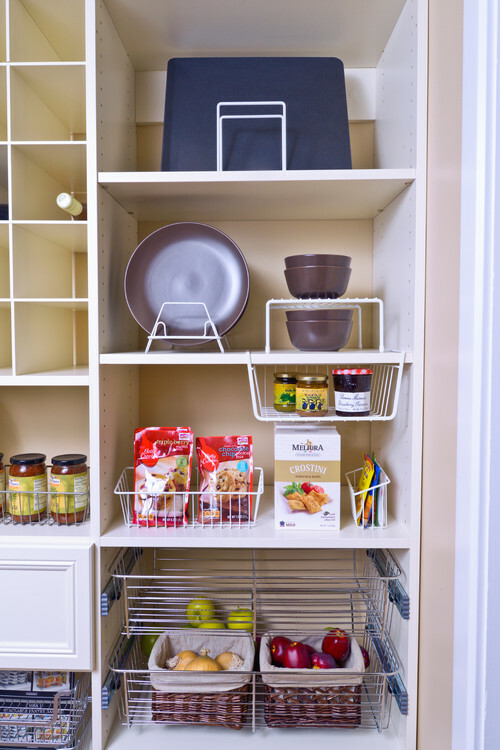 I like the pull-out baskets in this cabinet and could easily incorporate that concept into my cabinet. 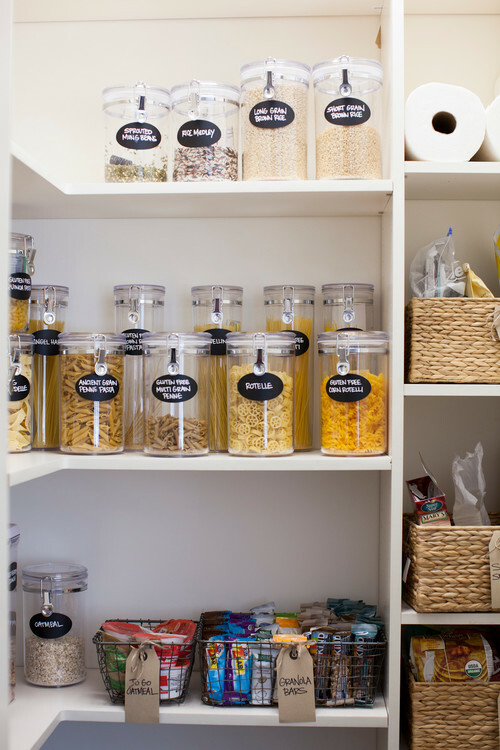 Are there really people out there whose pantry looks as neat and tidy as this one? I need to get clear containers like this to hold dry goods. It makes it so much easier to see what you’ve got on hand, as opposed to rooting through boxes that are piled on top of each other. I love the way the dishes are stacked and organized in this pantry. I’ve seen the wire kitchen racking in stores before and it’s just the ticket for my plates and bowls. Right now mine are stacked precariously high and it’s always a pain to slide one out. The wire baskets are also great. Rather than pilfer through cans and boxes to see what’s in the back, just slide the wire basket out! 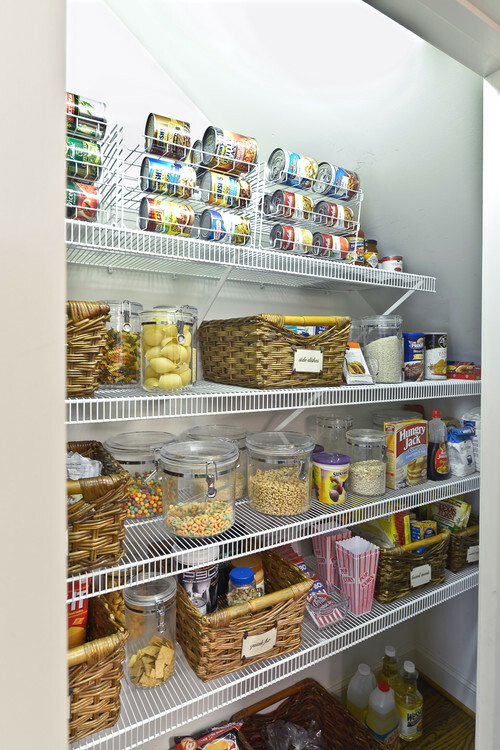 Here’s another pantry with great ways to organize the kitchen. The wire rack can holder is genius! Soup cans go on one level, vegetables on the next! I’m sure many of you organize your cabinets this way, but I’ve just never bothered to take time to do this myself. 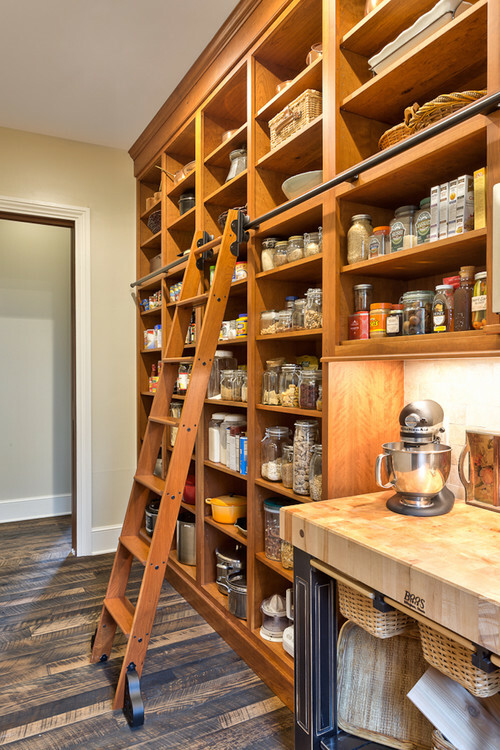 This pantry makes me want to get a ladder for my own kitchen! There’s a wall in my kitchen that would accommodate shelving like this, and since I’m not really tall, the ladder would come in handy. Plus I like the way it looks! 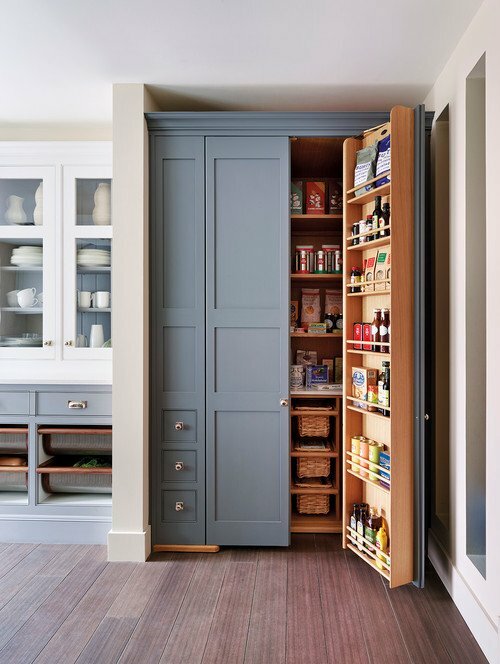 I’m in love with this built-in pantry! 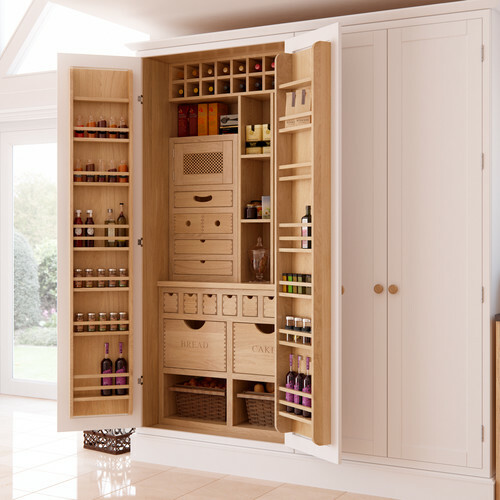 The wood interior is classy looking and drawers and shelves keep everything neat and tidy. Why do I not think of drawers when I think of ways to organize the kitchen? No, instead I have to fumble around and rummage through the pile of utensils in the drawer. And then when I spy the one I want, it grabs onto the tongs which take hold of the can opener, and the next thing I know I’ve got utensils spilling out of the drawer onto the floor. 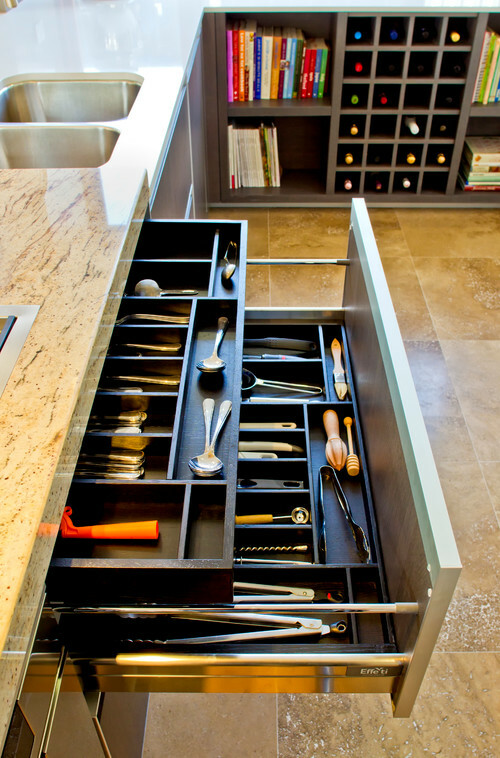 Drawer dividers are definitely on my to-do list for the kitchen! Love this cottage kitchen with its white cabinets, wood floors, and wood counter tops. But I also love the plate rack at the end of the counter. This is a perfect solution for storing frequently used plates. Instead of digging in the cabinet, just grab them off the rack. I mean, why put your prettiest plates behind doors where no one can enjoy them? Here, they’re on display! If I decide to store items in clear canisters, I’m going to add these chalkboard labels. Especially for the dried beans. I won’t remember which ones are navy or pinto. These would be pretty out on my open shelves, too. I’m looking forward to organizing the kitchen better after the holidays are over. What are ways you’ve organized your kitchen? I’d love to know! These are nice ideas I want to keep. I’m hoping once we settle, I’ll have a pantry. But the cupboards here are nice, too. Great storage solutions! I love the chalkboard labeled canisters. I enjoy reading all your wonderful posts. 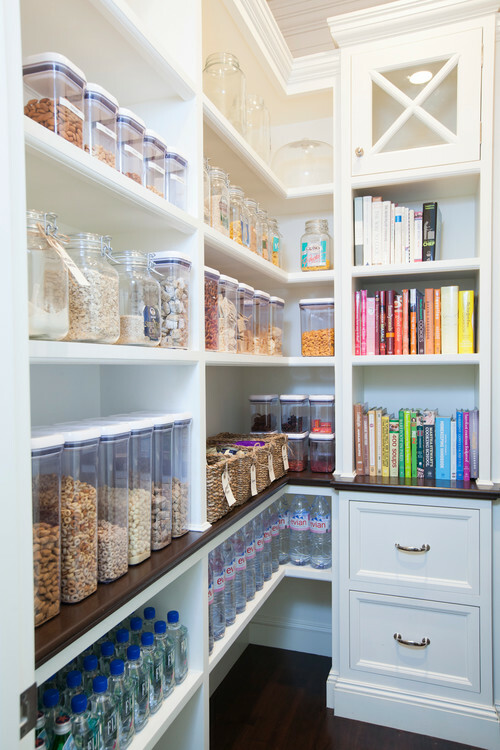 I just dream of having a pantry. The one with the ladder is my drool picture on pinterest. I bought upper cabinets like your built-in cupboard. Had to built a lower cabinet myself to set it upon. Sure filled it up fast! When I married my husband and moved in he had tons of the XOX air lock containers like in the second picture. I like how being square they nestle together and also stack. But the tops come off to easy. I don’t know how many times I have ended up with spilled couscous or corn meal to clean up. I like the look of canning jars and have been slowly converting into Quart and 1/2 gallon jars. My shelf’s and cupboard still do not look as nice as these pictures! I did get a few ideas tho. Really liking the wire racks for the can goods. I have never seen more clever storing ideas than those! Everything look so perfectly organized and well stored. I would like to change my kitchen and to look in that way! Thanks for the ideas!